We now have a DVD of the whole show and also a CD with 200 still photos – see the display board by the office. Mr Brook has very kindly offered to copy these for families - the DVD will be priced at £5 and the photo CD at £3, any profits after costs will go to the Friends. Please complete the slip overleaf if you wish to order, making cheques payable to the Friends of Sir Robert Hitcham’s Primary School (FSRHPS). As in previous years we are supporting Red Nose Day with the sale of Red Noses. We hope they will be on sale from Monday 2 March until Thursday 12 March – please note we will not have any for sale on the actual day. Noses cost £1 each, once your child has purchased one, we ask that they take it home to keep it safe and only bring it back in on Red Nose Day. Normal school uniform is to be worn. World Book Day Ltd has issued £1.00 book tokens to each child in the school. They can be redeemed at any bookshop participating in the promotion and are valid from Monday 2 March to Sunday 29 March 2009 and are enclosed with this letter. They can also be used as part purchase for a book worth £2 or more from the Travelling Book Company, or as part purchase for a book from the Scholastic leaflet to be issued to Key Stage 2 children with this letter. Tesco are again running their campaign for schools, to provide computers and/or sports equipment. The vouchers will be available from stores from 2 March until 7 June for every £10 spent. The box for collecting these will be outside the school office. These are being sent home today for years 1 – 6, please note there are no mid-year reports for Nursery or Reception children. We have a few booster seats (virtually unused) that we are offering for sale at £5 each. (We purchased them when the new car seat regulations came into force for transporting pupils to/from events, but have found they are not needed). In April, a new project is being launched called the ‘Home Access Project’, a Government initiative built on the understanding that pupils at both Primary and Secondary level can benefit from having access to a computer at home. The aims are: increased attainment of pupils; pupils engaged in formal and informal learning; increased parental engagement with schools/colleges; increased awareness of economic and social benefits of ICT access at home. Those who cannot afford the equipment may be eligible for a grant. Eligible groups are low income families, who are in receipt of one of the following: Income Support; Income based Jobseekers Allowance; Child Tax Credit (NOT Working Tax Credit) and on a low income; Guaranteed element of state Pension Credit; Employment Support Allowance (Income Related); Free School Meals. Look out for further information over the coming months. In Year 6 Science we have been looking at Earth and Space. There are some brilliant websites that show images of the Earth from space. The Earth has lots of satellites in orbit around it. 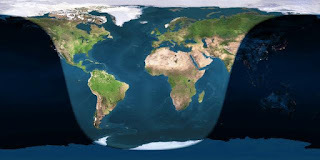 Click on the picture below to see live images of the Earth in light or shadow. 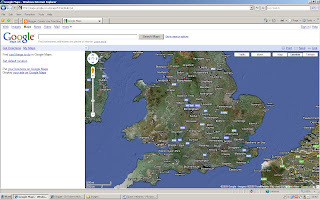 Click here or on the picture below to go to detailed satellite images of the Earth from Google. You can zoom in on your own town or house. Excitement has been building on the back playground today as workmen have been building our 'TRIM TRAIL'. The Friends Association have raised £10,000 to pay for this fantastic equipment. The men have been concreting in the pieces of the trail. This will be followed late this week by a new team of men installing a rubber base around all the equipment. This Musical adaptation of Aesop’s famous fable is written by Robin Brooks with some songs by Damien Evans. The play is based on a story of gratitude and holds a runaway slave (otherwise known as Androcles), helping a poor lion with a thorn in his foot (pictured left). Androcles eventually gets found and taken to the coliseum in Rome, sent to fight against a wild beast. By the time he was at the coliseum, the lion had been long gone, but Androcles had no idea that the wild beast he would be fighting is the same lion he helped in the forest. The lion is obviously grateful but couldn’t show it before, so know he shows his gratitude by saving his life. That is the basic of the story in the fable, but the play has a whole world of difference. So, here we go. Let’s begin. A group of lions are gathering (group includes Chief Lion (Kezia Bayfield), Hyena (Theo Bimson) and others (Joshua Briggs, Milo Dring and Elisabeth Garrett)) but among them all is the most cowardly lion you have ever met…Timothy Lion (Charlotte Matheson-Barr). Send to attack any creature; Timothy gets stuck with a thorn “the size of a biro” in its paw. By chance Androcles was walking that way when he saw the lion. First of all he was afraid but when he played dead, he heard the lion sobbing. Androcles saw the thorn and took it out, and was returned with gratitude from the lion. So Androcles ends the first act alone, but how will he end the second? The second half kicks off with Androcles encountering the devious sergeant, Antifres (Alfie Hulbert) and his master mind centurion, Serious Illness (Izzy Brooks). Between them, they convince Androcles to join the circus, but not any circus, no sir, only the Circus Maximus in Rome! They take him on a long journey and when they get there, Androcles gets introduced to the master of the gladiators, who actually turns out to be our good friend Dirtines, actually. But only one thing stands between Androcles all the gladiators (Joshua Briggs, David Orrell, Elisabeth Garrett, Milo Dring, Hattie Hopkins and Maija Fox) freedoms. That thing is Applemax. Androcles and Applemax are then put in a fight to the death in front of the emperor himself, Nero. Dirtines suggests that they put in one of the brand new wild beast’s in. the emperor and crowd finally agree on something and before you can say ‘bobs my uncle’ the beast had been released and was chasing Applemax. When the beast, which was a lion, gave up it turned to Androcles. Then they both immediately recognise one and other and hugged. When Nero questions the matter, Androcles tells him the story and Nero finds it so touching he makes Dirtines into a senator and gives Androcles, Applemax and Timothy their freedom. Then we get told that Androcles, Timothy and Applemax have opened a café down by the sea side. “The play is exciting in both song and drama through the first half” explains Androcles actor William Debenham. “My favourite song from the first half is probably ‘Just like a Roman’, adds Timothy actress Charlotte Matheson-Barr. “Yeah but scenes like the one with the lion pride are really cool” encourages Dirtines actress Grace Englert. “Well I like the second half because it’s got my solo ‘It’s lonely and sad at the top’ in” says Katie Russell, who plays Applemax. “Yeah, But the other songs in the second half are more…… complex” Points out Story teller actress Lucy Johnson. “Well I think the songs from the second half don’t have as much action as the first half songs, but that doesn’t make it any less great” butts in the emperor, Alias Theo Bimson. “I think MY favourite songs are any out of ‘The second half of the show’, ‘It’s lonely and sad at the top’ or ‘Bread and circuses’, quotes Song writer Damien Evans. With shows like ‘Wilbur and the Web’ and ‘Alice in Wonderland’ and songs such as ‘Something in your paw’, ‘Travelling Blues’ and ‘Choices’ to go by, this show will be a hit! This review was written by Freddy Legg from class DB. Mr Brook has taken over 200 photos. This will be available to order after half term. He has also made a video of the play. The mere was an incredible size this morning after the overnight rain. Riverside near the Coop was aptly named and the Elms car park was half flooded. There was the funny sight of a fire extinguisher sitting in the middle of a flood. Half-term is next week (16 February) and the children return to school on Monday 23 February. These reports about your children will be out at the end of the week after half term, they are confidential and are addressed to you as parents, please can parents advise your children not to open the reports. Due to the upper KS2 school production, we will have to cancel all recorder clubs for this Thursday only. You will need: a cup of honesty, 4 clovers of good luck, a dash of friendship and a big dollop of sensitivity (If you have no sensitivity you can use carefulness) and of course, a person. 1. Tip the cup of honesty over your person, you now shouldn’t be lying to them. 2. Hold the clovers in your hand and blow them onto the person, you should now be very lucky with your friendship. 4. Eat the dollop of sensitivity (you should now be as kind as possible if they become upset). If you have no sensitivity wipe the carefulness onto your hands, you should now be careful with your friendship. 1 March). If you are unable to access these online please see the hardcopy in the school office. From 11 February until 3 June vouchers will be available from Sainsbury stores for every £10 spent. The school will collecting these once again in the box by the School Office. One of our parents - Mrs Helen Evans - has been working very hard behind the scenes preparing costumes and props. All of the main characters have had their portraits taken. These will be in the Theatre entrance hall during the production. Mr Brook will be taking photographs and video during the performances. These will be available to parents after half term. These portraits are of The Emperor Nero, Timothy The Lion and Applemax with Androcles. Even our school mascot 'PRICKLES' has got involved in the play. Watch out for his cameo appearance during the performance. Our after school sports club on Tuesdays are playing touch rugby at the moment. In order to play some competitive matches the children have organised themselves into 4 teams. Each week they will get to play some matches within a mini league. You can see the teams below. Rehearsals for our school play are in full swing at the moment. The prodution has been written by two of our talented parents: Mr Brooks and Mr Evans. It is a musical and amuzing version of the classic fable by Aesop. You can listen to one of the songs below. If you would like to read or listen to the original Aesop version then follow this link. Our production takes place in the Athlone Hall at Framlingham College next Wednesday afternoon and Thursday evening. The Friends Bingo evening was a great success. Everybody enjoyed themselves partly thanks to Mr Hopkins calling technique. As usual a big thank you to members of the Friends organising committee. Thank you to everyone for their support of the One Christmas project. £35,000 was raised for ‘Tearfund’. Over 3500 CDs and DVDs were sold in Suffolk and 4000 people attended the 7 concerts. This was a great achievement that was supported by 200 volunteers and 40 Suffolk schools. We are pleased to let you know that we raised £255 on Friday which we will be sending to the NSPCC. There were some lovely entries for this competition, well done to all who contributed. The picture selected to go on the cover of the DVD was by Molly Howard, and the title chosen was thought up by Kimberley Broadhurst ‘The Road Code’, with an additional slogan by Sammy Grant ‘Don’t be Silly, be Safe!’ Prizes will be on the way. We hope to have the DVD completed shortly for the children to view in school. ADHD; Child Obesity; Dyslexia; Bullying; Special Education Needs; Divorce and Separation. If you wish to borrow any of these titles, they can be found in the rack between Class CH and Nursery. Please sign them out/in on the list attached to the rack. Please can we remind parents to avoid last minute phone calls about after school collection changes for their children. Wherever possible, please plan in advance to tell the teacher in the morning or ring earlier in the day. It can be difficult for the office staff to get messages to several teachers at 3pm about who the children are going home with, especially if they are in assembly. Thank you. The Friends still have tickets for this Fridays Bingo Night. It is a great evening that children of all ages can enjoy – with lots of prizes to be won. Any donations of tray-bakes for refreshments will be gratefully received. Thank you. We have some pale green upholstered chairs from our old staff room; they are going free (or for a donation if you wish). They need to be removed by Friday 30 January; else we will dispose of them. For their own safety, please can we ask parents not to let Nursery children and their siblings play on the stairs next to the nursery entrance in the morning. Your co-operation is appreciated, thank you. Robert Hitchams and Thomas Mills are closed today. Eric (the Snowman) hopes you enjoy the free time.